Richard Doumeng has been helping manage Bolongo Bay Beach resort with his family since the 1970’s. For that same amount of time, this has been plaguing his property. Doumeng said the issue has been ongoing for the past forty years. He called it a lack of a land use plan in the valley. With Thursdays’ rain hitting hard on the island it revealing just how deep the problem goes. The beach bar was destroyed by Hurricane Irma but now this is running through its’ front yard, making it difficult for crews to get in to rebuild. “I would like to open Iggys too but I don’t know how to even get there,” Doumeng added. Doumeng said he has been working with the Virgin Islands Department of Public Works and the US Army Corps of Engineers on a flood plan and solution. But he fears for the future not only of his business but of the entire beach if the problem isn’t addressed soon. For now, the water continues to flow. 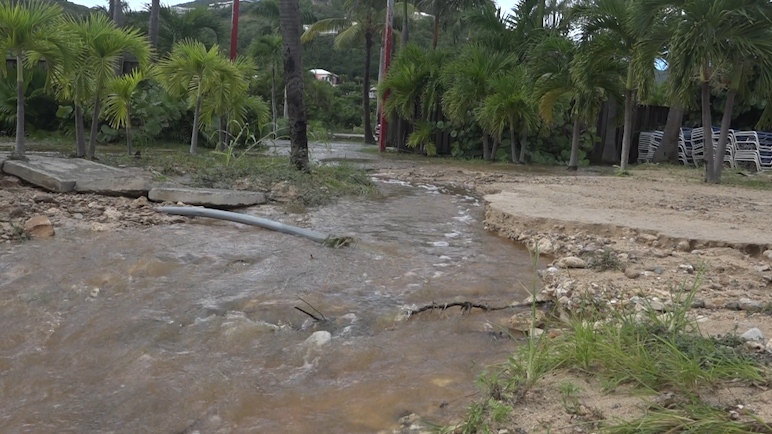 CBS USVI reached out to the Department of Public Works for response and has yet to hear back.